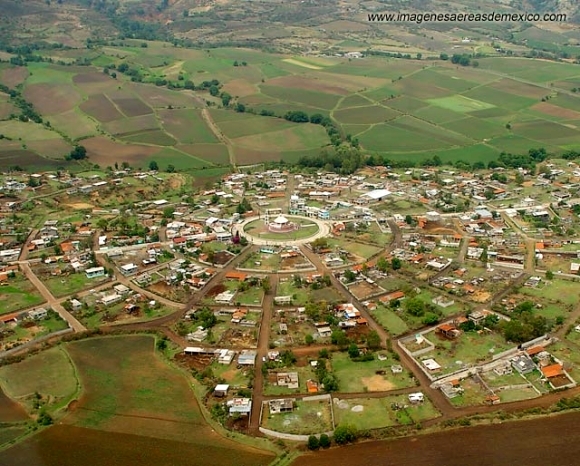 The small settlement of Venta de Bravo, in the municipality of Contepec in the state of Michoacán, has a very distinctive street pattern. As the image shows, it has a circular “center”, surrounded by a series of concentric circular streets (see image), connected via regularly-spaced radial streets. The regularity of the pattern is not quite perfect. Based on the photo, the imperfections probably result from variations of topography. The village has about 1300 inhabitants and is at an elevation of 2290 meters above sea level. This is clearly a “planned settlement”, and one almost certainly quite modern in origin. I haven’t ever visited Venta de Bravo and don’t know its history, but would certainly be interested in finding out more if you have any pertinent information or can suggest likely sources. An online search for Venta de Bravo will turn up numerous articles about the seismically active 45-km-long Venta de Bravo fault, as well as references to the small “Rayón National Park” which is only a few kilometers away in the Sierra of Tlalpujahua and extends as high as 2770 meters above sea level (Cerro del Gallo).